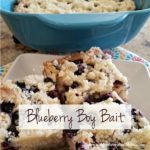 BLUEBERRY BOY BAIT - buttery goodness loaded with sweet blueberries. Coat a 9x13 rectangular baking dish with non-stick spray. Combine flour, sugar, salt, baking powder and butter in a medium bowl. Using a pastry cutter or two forks, cut ingredients together to make a crumb mixture. Reserve 3/4 cup for later use. In a small bowl, beat eggs slightly. Add milk and vanilla; stir. Add flour mixture to liquid mixture. Stir to combine. Transfer the batter to greased baking dish. Scatter blueberries on top of the batter, then sprinkle reserved crumb mixture to finish. Bake for 35-45 minutes, until toothpick insert in center comes out clean. Nutritional information is only provided as a reference.